Hey, Happy New Year to YOU!!! Right now, I’m on my annual retreat where I revisit my goals, establish new goals, look at what I want more of, less of, and with whom! And I want to begin by acknowledging someone who’s made a very significant and important difference in my life. Twenty years ago I met Joyce Chapman at her book signing in San Diego. She does amazing work in the field of self-empowerment and human potential, and has a very playful style. I immediately absorbed her work, and it helped change my world by creating a litany of new beginnings — i.e. new career, new US state, new life! Much later (around 16 years later), I contacted Joyce when I found myself “stuck” and knew I needed help to climb through the mire and shake things up. She became my personal coach and helped me move past the sudden death of my fiancé. 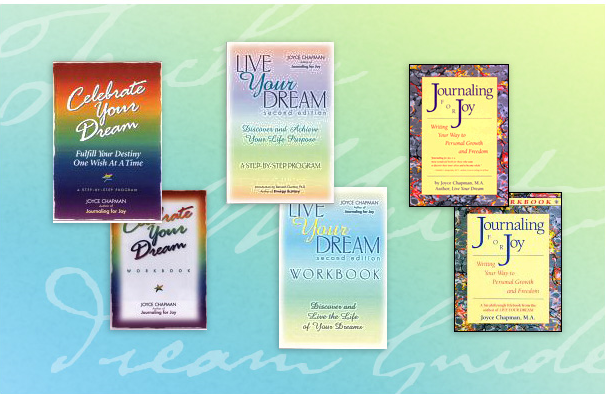 I’ve long been a huge proponent of Joyce’s techniques, including daily journaling, and creating Dream or Vision Boards on a regular basis as a visual reminder of goals. So, as I finish my 2015 vision board (my 8th or 9th in total), I think it’s fitting to share the work of someone that I think is very special. Someone who has helped hundreds of thousands of dreamers realize their dream is possible. Someone who epitomizes “living with passion and joy”. Someone who has touched my life in more ways than she knows … and for that, I will be eternally grateful. See Joyce’s blog and books at http://joycechapman.com/. If you have a question, drop her a line … I know she’d love it. Or share YOUR 2015 goals and dreams here. P.S. Next post will be on How to Create Your Empowering Vision Board.